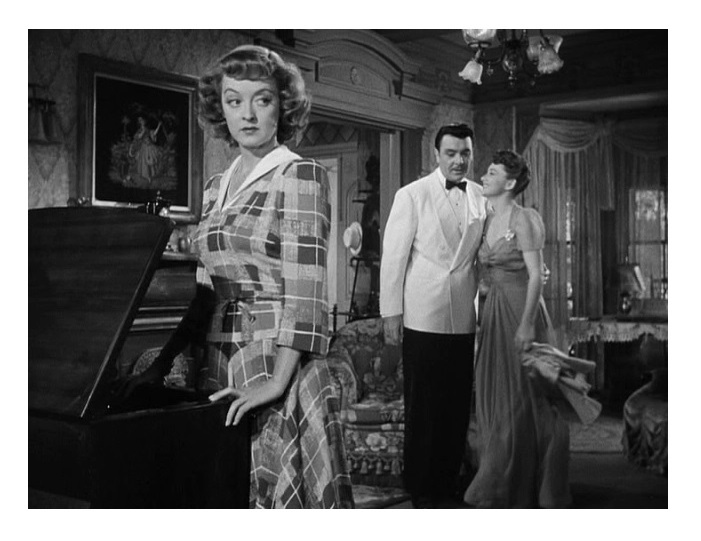 In a small Southern town, a spoiled young woman (Bette Davis) creates havoc after she dumps her fiancée (George Brent, Dark Victory) and takes off with her older sister’s (Olivia de Havilland, The Heiress) husband (Dennis Morgan, Kitty Foyle). Director John Huston (The African Queen) followed up his 1941 classic The Maltese Falcon with this turgid, high voltage melodrama based on a Prize-winning novel by Ellen Glasgow, adapted to the screen by Howard Koch (The Letter). In This Our Life anticipates films like Picnic, Peyton Place, and The Long Hot Summer; all of them decidedly unfaltering explorations of small town America. Author Glasgow reportedly hated what Huston and company did to her Pulitzer Prize-winning book, but I thought this was a multifaceted movie. The film is not quite in the league of something like Kings Row, Warners’ more famous 1942 dark Americana, but In This Our Life is a well-crafted examination of the dark underbelly of a sleepy town. Davis’s characterization tends to divide moviegoers. As usual with Davis the complaint is that she overdid it. Personally, I thought she did a great job portraying this fiendish town girl. It is a character devoid of a single good emotion and Davis manages to give life to what is essentially a one-note character. It’s psychopathy in its rawest, purest form. I don’t think she ever played an uglier character. Unlike William Wyler, who always encouraged Davis to add extra dimensions to her characters, Huston opted to let her zero in on ugliness and the result is unfiltered villainy. Davis was nearly ten years older than de Havilland and it takes an effort to accept Davis as the younger, capricious sister of “matured” de Havilland. But both actresses pull it off mostly through sheer force of will and talent. Interestingly, both characters have male names — Stanley and Roy — and I have yet to figure this out. The subplots are every bit as compelling as the main storyline. Charles Coburn’s (The Paradine Case) lecherous uncle is shocking to say the least. I’m a bit surprised that the censors didn’t object to this character. You have to be blind not to notice that he’s lusting after his own niece. And Davis’s character toys with these icky feelings in a rather grotesque manner — there is no attempt to hide the incestuous relationship between uncle and niece. The section regarding the ambitious black-man is also very interesting. The character is played by Ernest Anderson, who at the time was working as a cafeteria waiter, and the newcomer makes an undeniably impression with his subtle performance. Hattie McDaniel (Gone with the Wind) plays Anderson’s mother, and although she’s again playing a servant, this is one of the few times in her career that she was allowed to add depth to a character. Also in the cast are Brent, in his eleventh and last film with Davis, as Craig Fleming, and Frank Craven (Shadow of A Doubt) and Billie Burke (The Wizard of Oz) as Davis’s and de Havilland’s parents. Walter Huston (The Treasure of the Sierra Madre), the director’s father, has a cameo as a bartender. Rumors persist that cast members of The Maltese Falcon appear in the bar sequence, but this is false. 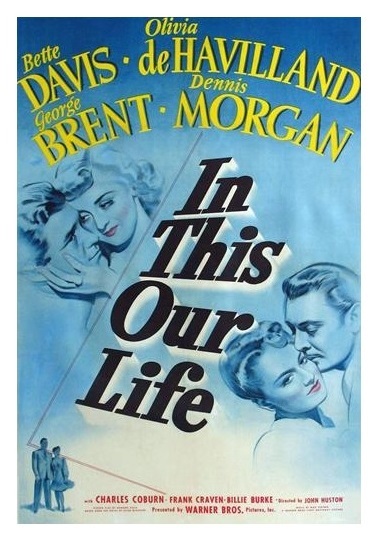 In This Our Life is much better than its reputation might lead you to believe — the antithesis of Hollywood’s cheery, fun-loving Andy Hardy films. And you don’t want to miss Davis’s fierce performance. B&W, 97 minutes, Not Rated. Awesome review, Eric. I want to read the novel first. I bet Glasglow’s book is better. Then, I’ll watch this one which has escaped my attention. Thanks for reviewing it! Agreed. This is a short film and I’m sure the novel goes into great detail about the dysfunctional family. I know you saw my review of this film and I’m happy to see we share much the same opinion of it. I thought it was very good, and while it may not have done the book justice, it was progressive for its time. 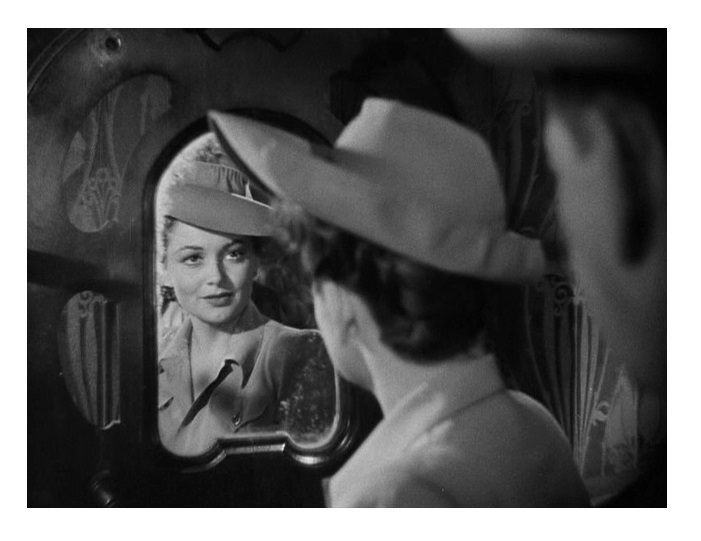 Plus I’d have a hard time disliking anything in which Bette Davis and Olivia de Havilland star together…okay, I’d judge the film on its own merits, but I’d be predisposed to trust it’s good. Davis regretted making the film, but I thought the movie was very good. She insisted that the book was much better (I haven’t read the book, so I can’t compare). It has great production values, the acting is good, and plot is interesting (as you said, way ahead of its time). I can see where the book might be able to delve more deeply into the thoughts and motives of the characters, but I too thought the movie was very good and I’m sorry she regretted making it. I suppose it’s possible she had imagined it differently than the way it turned out. Or any number of other reasons. You are probably right. She obviously read the book and the film didn’t meet her expectations. Anyhow, this is one movie wouldn’t mind seeing remade. Dysfunctional families appear to be in vogue at the moment so I think there is an audience for the story. I agree. And if nothing else, seeing this movie made me want to read the book.